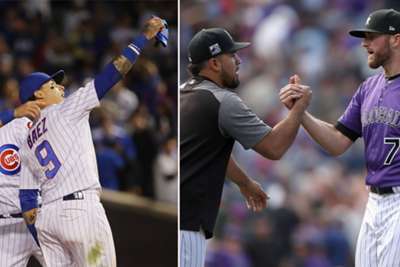 The Colorado Rockies and Chicago Cubs did exactly what they needed to after earning wins and extending their division leads to a full game in MLB action on Thursday. Prior to play, playoff hopefuls the Rockies and Cubs were in a position where they could be heading into their final matchups of the season in a tie for the division lead. But thanks to Colorado's 5-3 win over the Philadelphia Phillies and Chicago's 3-0 victory against the Pittsburgh Pirates, both teams can lock up their respective divisions by winning out. Not to say that is going to be easy, the Cubs have to defeat a St Louis Cardinals team who are on the ropes and the Rockies have to take down a Washington Nationals outfit that are fighting for some dignity, but the fact is if the teams win, the divisions are theirs. The Milwaukee Brewers, who are now one game back of the Cubs in the National League Central, host the Detroit Tigers in their final three games of the season. The Los Angeles Dodgers – one back of the Rockies as well – face off with the San Francisco Giants on the road. The only way either team can win their respective divisions is for the Cubs or Rockies to lose two out of three in their final series of the season. They can tie if they sweep and the Cubs and Rockies win two out of three or if they win two of three and the Cubs or Rockies lose two of three. Giancarlo Stanton went two for three with two solo home runs and two walks in the New York Yankees' 12-1 rout of the Tampa Bay Rays. New York Mets starting pitcher Jason Vargas tossed seven shut-out innings with six strikeouts in a 4-1 win over the Atlanta Braves. Tigers reliever Matt Hall allowed five hits and four earned runs in one inning of work in a 9-3 loss to the Minnesota Twins. Kansas City Royals shortstop Adalberto Mondesi maintained the tie for his team in the eighth inning via a nice play in the hole with runners on second and third, and two outs of a level game against the Cleveland Indians. Kansas City won 2-1 in 10. 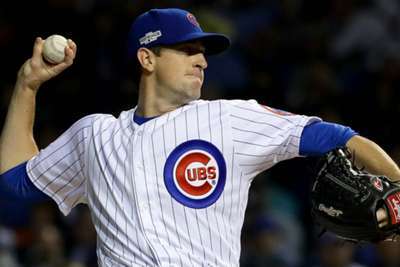 Cardinals (87-72) at Cubs (93-66) — Adam Wainwright (2-3, 4.08 ERA) vs. Kyle Hendricks (13-11, 3.49). The Cubs have a one game lead on the Brewers. Tigers (64-94) at Brewers (92-67) — Jordan Zimmerman (7-8, 4.31) vs. Zach Davies (2-7, 4.65). The Brewers really need a sweep if they want to win the division. At the least they have to win two of three. Nationals (81-78) at Rockies (89-70) — Joe Ross (0-1, 4.09) vs. Kyle Freeland (16-7, 2.84). Freeland is 9-2 with a 2.36 ERA at Coors Field this year. Win Friday and Colorado require only one more victory to seal at least a tie for the division title. Dodgers (88-71) at Giants (73-86) — Hyun-Jin Ryu (6-3, 2.00) vs. Madison Bumgarner (6-6, 3.20). The Dodgers got a tough draw here as Bumgarner will undoubtedly want to prevent a division rival from getting closer to the playoffs. Los Angeles need a sweep too.